Every day, 10 people are killed by landmines. Besides claiming such a substantial number of lives, landmines form an obstacle to post-conflict reconstruction efforts. Foreign trade and development cooperation minister Lilianne Ploumen said: ‘The devastating impact of landmines doesn’t stop when the violence ends. Emergency workers are left unable to reach the places where they’re needed, refugees can’t return home and farmers can’t access their land. ‘The Afghans can count on our support, though we will remain critical. With our international partners, we will continue to support Afghan security troops and contribute to the socioeconomic development of the country.’ Foreign minister Bert Koenders made these comments today at the international Afghanistan conference in London. Conflict over water is an increasing problem all over the world and the Netherlands has a unique combination of expertise in water management and international law. With that in mind, Minister for European Affairs and International Cooperation Ben Knapen has asked four organisations based in the Netherlands to set up a new Water Diplomacy Consortium to help resolve water conflicts. Afghanistan needs economic growth and good governance just as much as security. The Netherlands has stressed this point at the NATO Summit in Chicago, prime minister Mark Rutte has told journalists. Today the NATO allies will consider the strategic plan for Afghanistan from 2015 to 2017. The country will then be responsible for its own security, with funding from the international community. The Netherlands will contribute an annual €30 million: €25 for policing and €5 for the armed forces. Last Sunday saw the official launch of the third police training group (PTG) in Kunduz. In a ceremony held at Camp Kunduz the Ministry of Foreign Affairs’ Civilian Representative, Matthijs Wolters, passed on the baton to his successor, Simon van der Burg. Colonel Nico van der Zee presented the unit flag, and command, to his successor Colonel (MC) Jarst de Jong. Seventeen Afghan policewomen have been awarded their diplomas. At the presentation ceremony on 28 December, General Mohammed Ayub Salangi, the chief of police in Kabul, repeatedly underlined the importance to the national police of training more women officers. He also talked about the Dutch police training mission in Afghanistan. ‘Women represent 50% of human capital. It is in every country’s interest to make sure that they are actively involved in society, the economy and political decision-making.’ These words were spoken by Minister of Foreign Affairs Uri Rosenthal in Leiden on Monday afternoon when he attended the launch of the second National Action Plan to implement Security Council Resolution 1325 on women, peace and security. Mr Rosenthal stressed the importance of women’s leadership and political involvement in peacebuilding efforts in conflict-affected areas. The Afghan authorities in Kunduz have expressed the need for more training courses for lower-ranking police officers and for prospective Afghan police instructors. These courses would come on top of existing courses for police recruits. The government believes the Dutch police training mission should respond to this request. They have the support of a majority in the House of Representatives. Development of the Afghan agriculture sector is vital for both Afghanistan and for the Netherlands, in the opinion of international cooperation minister Ben Knapen. With this aim in view, the Netherlands is supporting Afghanistan’s national programme for agricultural education, which is making a positive difference for many Afghans. The Dutch government informed the House of Representatives and the Senate today of its decision to deploy a team of 545 to Afghanistan to train and instruct the Afghan police. The aim of the mission is to strengthen the civil police and the criminal justice system in order to improve the rule of law in Afghanistan. The mission will be to provide training and instruction so personnel will not be deployed for offensive military activities. Minister of Foreign Affairs Uri Rosenthal announced today that the Dutch aid worker and Afghan driver who were abducted in Afghanistan on 25 October have been released. Rosenthal: 'I am pleased that the abduction ended like this. I would like to compliment the Afghan authorities and Streams Afghanistan on their effective action, which brought this situation to a good end. The Ministry of Foreign Affairs and the embassy in Kabul assisted them in their efforts. Representatives of the Afghan NGO The Liaison Office (TLO) are visiting the Netherlands from 5 to 7 October to present a report on the results of the Dutch mission in Uruzgan, which lasted four years. Today, the organisation will present the report to the media at the Nieuwspoort international press centre. Development minister Bert Koenders says that Afghan women should be allowed to address the Afghanistan conference that will take place on 28 January in London. 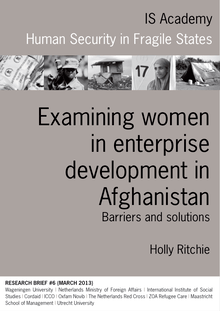 He believes that still too little attention is paid to women's role in Afghan reconstruction. 'Women are indispensable to the reconstruction of Afghanistan,' said Mr Koenders. 'Yet in recent years the number of women working in the public sector there has continually declined from an already low level. Uruzgan's new Business Development Centre opened its doors this week. The Centre, which was set up with Dutch support, helps new enterprises and provides training courses for local entrepreneurs. Apart from courses in bookkeeping and management, the Centre provides computer and language courses, for both men and women. All courses are free of charge. In Pakistan, Mr Koenders met with President Asif Ali Zardari and Chief Justice Iftikhar Chaudhry. He was also the first European minister to visit the Swat valley, where the Pakistan army conducted a major offensive against the Taliban. 'The plight of Pakistani refugees is too often forgotten,' development minister Bert Koenders said at the end of his five-day visit to Pakistan and Afghanistan. 'Military action is important because the Taliban pose a real threat to security. Many schools have been destroyed. Development minister Bert Koenders and the German government will today begin working together on three infrastructure projects in southern Afghanistan. They involve the construction of arrivals and departures halls, an access road and the training of staff for the airport at Kamp Holland near Tarin Kowt, and the future construction of a technical school in Uruzgan and the renovation of an existing technical school in Kandahar. 'These projects are vital for the future of two of the poorest provinces in one of the poorest countries in the world,' said Mr Koenders.